Enhance your child’s play-date experience! 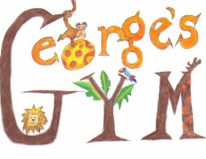 When you hire George’s Gym you can rest assured that your children will be safe and fully involved in an active, learning and fun environment. We will write a customized lesson plan for your group, filled with games, group activities and crafts, that will keep your children having fun and fully engaged for the entire time we are working with them. Just bring all the children to one place and we will bring the equipment, staff and activities to build a strong and unique social/learning experience! Payment Policy ~ All weekly Private Home PWT's must pay for at least 2 classes at a time. You can choose a different payment schedule ($45 every 3 weeks, $60 per month or more), but each parent must pay at least $30 per child every other week.